The one thing I always regretted about my Sweetheart Mittens was that the hearts were too small to embroider words on like the candies. So, I decided to whip up a pair of handwarmers with bigger hearts that allow you to embroider on them. 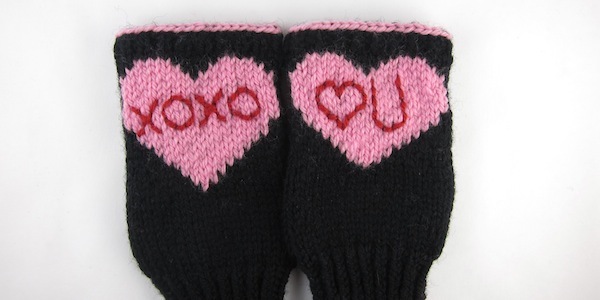 Download the Conversation Heart Handwarmers Pattern. 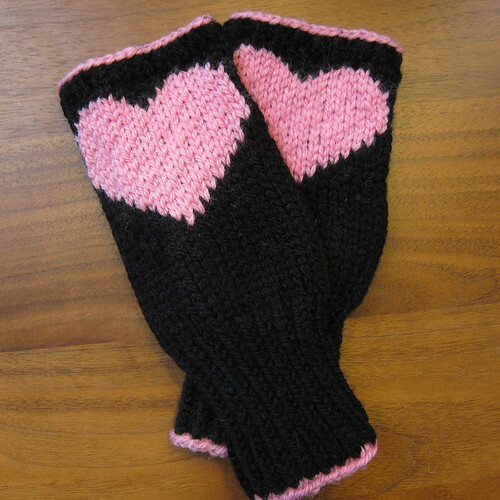 I used stranded knitting to add the hearts to my handwarmers. 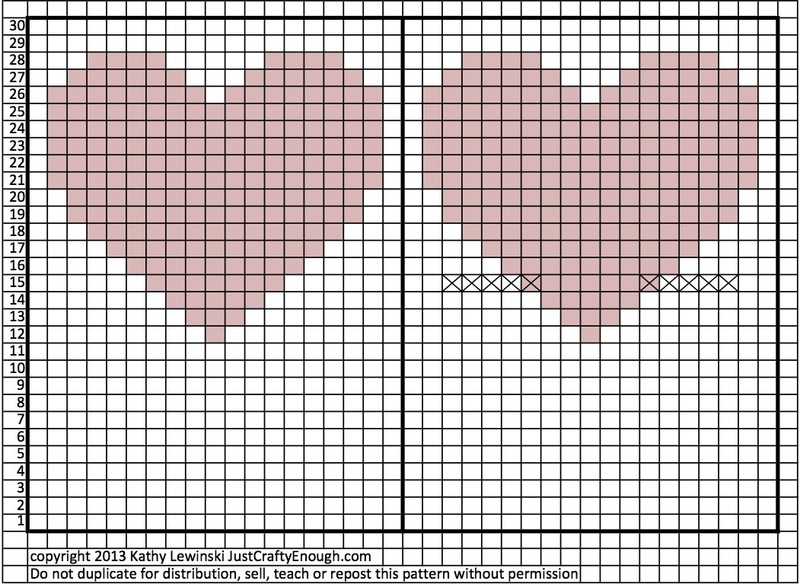 If you don’t want to or don’t know how to knit color work, you could duplicate stitch the hearts on after knitting the handwarmers or stitch on an embroidered felt heart. Size: Women’s size large (8 inches) It is very easy to adapted this pattern by changing the gauge. You can also change where the thumb hits. I have a long hand, so I put the thumbhole up 2 1/2″ from the wrist, you can move it to fit your hand better. With pink yarn cast on 36 stitches on one of the double-pointed needles. Starting back at the beginning of the row with the right-side facing, change to black yarn and knit a row. Divide the stitches evenly between three needles. Join in the round being careful not to twist. Place a stitch marker between the first and last stitch to mark rounds. With black yarn, work in k1, p1 ribbing for 3 inches or desired cuff length. Cut off black yarn leaving enough of a tail to weave in. Bind off using pink yarn. Carefully remove the scrap yarn from row 15, picking up the stitches as you go. Put the stitches on top on one needle and the stitches on the bottom on another. You should have 6 stitches on top and 5 on the bottom. Using the black yarn pick up and knit a stitch between the top and bottom stitches from the hand. Now bind off the stitches on the bottom. Pick up and knit a stitch between the bottom and top stitches, then continue binding off. You can leave the hearts blank for a very sweet handwarmer. Or you can embroider on sayings like those on candy conversations hearts. I used a simple backstitch. Be careful not to pull the yarn you are embroidering with too tight or your stitch will be lost in your knitting. I found it easiest to get some sort of centering on my lettering by starting in the middle, though the words on the candy hearts are usually off-center. Just a note on yarn. I used Red Heart Washable Ewe for these, because I had it and the colors were right. I really struggled with the color work looking good though. The problem was that despite the fact I was using the same yarn the black was noticeably more thick than the pink. This meant the pink didn’t cover the back as well as I’m used to getting when I do color work. It was really frustrating. They looked a bit better after some blocking, but in the future when I notice this I will switch yarns. 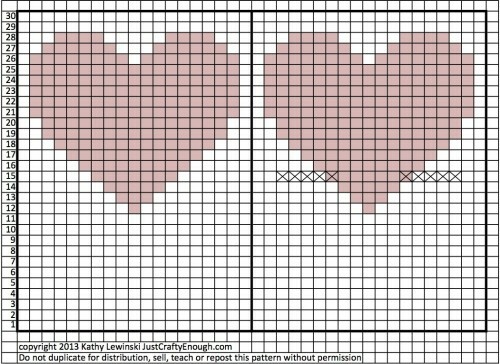 6 years ago by Kat in Holiday , Knitting , Knitting Projects , Needlecraft , Projects , Valentine's Day | You can follow any responses to this entry through the RSS feed. You can leave a response, or trackback from your own site.